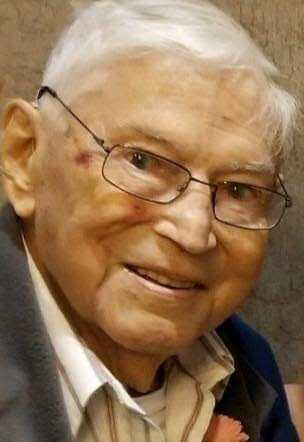 MALTA-Robert “Bob” Bushman passed away at his home surrounded by his family on March 21, 2019. Bob was born March 30th, 1924 in Wolf Point, MT. The eldest of 10 children, he was born to Thomas and Victoria Beauchman. Bob and siblings were raised and went to school in Wolf Point. He worked doing miscellaneous jobs around Bainville, Wolf Point, Frazer and Poplar, until May 21st, 1943, when he enlisted into the Army as a Private 1st Class for the U.S. Army Corps of Engineers during World War II with the 699th Petroleum Distribution Engineers in China-Burma- India (CBI) Theater of Operations. While enlisted he earned several medals including the Army Good Conduct Medal, Asiatic-Pacific Campaign Medal with one bronze star, World War II Victory Medal, Honorable Service World War II Lapel Button, three overseas bars, and the World War II Commemorative Medal. He was honorably discharged on October 3, 1945. He returned to Wolf Point where he met the love of his life and best friend, Rosemary (Pat) Morgan. They married on October 26th, 1946 in Glasgow, MT. After living in Bainville and Glasgow, they settled in Fort Peck. Bob and Pat have 11 children, 9 girls and 2 boys which included a set of twins, raising all of them in Fort Peck. Bob retired from the Corps of Engineers in May of 1979 at which time they decided to move to Belt. While there, Bob was on the volunteer fire department, worked part-time at the State Liquor Store, and had a column in the Belt Valley Times for which he wrote stories. In 1991 they moved to Malta and made this their home. Bob and Pat loved to travel, traveling to Georgia to see his brother or to ND and SD to see two of their daughters. On August 16, 2000 the Lord called Pat home. Bob remained in Malta living with daughter Ruby Bushman who moved in to care for him. Ruby would take him on his yearly trips to ND and SD. Bob loved spending time with his family. His favorite past times were fishing, hunting, and playing poker with his kids, especially his grandsons. His grandsons thought they could beat their grandpa at cards, but it always turned out the other way around. Not only did Ruby take Bob on his yearly visits to ND and SD, but she was there to take Bob to his Dr. appointments in Billings or Great Falls, taking him to the hospital when needed, caring for him after his surgeries. If Ruby was unable then one of the other siblings would step in to assist, but for the most part Ruby was there 24/7. The last few months Bob’s health declined drastically to the point Ruby put her job on hold to care for him. Enough thank you’ s cannot be said to her for what she did. Bob is survived by nine daughters, Vicki Jernigan of Great Falls; Alice “Spike” and Ken Herman of Rapid City, SD; Bette Jo and Rob Maki of Belt; Pearl and Rich Schneider of Bismarck, ND; Deb and Joe Nicholson of Malta; Ann Moe of Wolf Point; Wanda and Al Resor of Malta; Ruby Bushman of Malta; and Ramona “Tutti” and Dan Adams of Belt; two sons, Bob, Jr and Barb; and Merle both of Malta. 40 grandkids, 91 great grandkids, and 8 great, great grandkids, two sisters, Pearl Lapke of Simms and Patricia Mulligan of Glasgow, one brother, Jim Beauchman of Tucker Georgia, and several several nieces and nephews. He is preceded in death by his wife, parents, three sisters, Sue Ramona, Ruby Nelson, and Dean Gay, three brothers, Thomas, Albert and Franklin, one son-in-law, Gerald Moe, and one granddaughter, Amanda. We send our prayers, happy remembrances, and joy in honor of your father and the wonderful life he lived. I am so sorry for your loss.. My thoughts are with you all at this difficult time. So sorry for the loss of your father. I use to clean his house for him. He always had a funny story to tell or some advise. He was a great guy. Thoughts and prayers. So sorry for your loss of “Gramps”. He was truly one of a kind and will be dearly missed. Hugs to y’all. My Deepest condolences, My Prayers are with you and all The Family. A good friend, he will be surly missed by all. Sorry to hear of Uncle Bob passing. He was such a kind and gentle man. I believe that he was met at the Pearly Gates by Dad, and Franklin and by his loving wife. There has to be some kind of party going on up in Heaven with all the Bushman and Carson families attending. Wish I could be there on Wednesday but since I just got home from Fort Peck the drive is to much. Hugs to the Bushman kids, he will be greatly missed. I know that no amount of words can express the amount of pain you are experiencing right now and it is difficult to find the right things to say to express how deeply sorry I am for your loss! Just know that I am there in spirit and I send love and hugs your way! And remember.... A father's guiding hand always sits on the shoulder of his children! Love you all. Love and prayers to all of you. Bob was our great neighbor and friend. He will be missed by many. He loved his family above all. He is with his Pat again. ❤️. Peace be with you! I remember growing up in Ft Peck...Mr. Bushman was a favorite of mine. He was a gentleman with a warm composure. Dear Pearl, and the entire family of 'Bob'. Words seem inadequate at the passing of such a fine man. Knowing you, and the wonderful way you cherish people, has allowed me a glimpse of your father's compassion and love towards all. God certainly blessed his beautiful marriage with Rosemary in God's promise to Abraham, "I will make your descendants as numerous as the stars in the sky". His Legacy will forever be enshrined with each of you, forever. May God blanket you, and your family with His Love. My thoughts and prayers are with your family. May you find peace in the coming days as you say farewell. You are in our thoughts at this time. Our hearts go out to you as you celebrate a life well lived!